Golf, like most everything, has been revolutionized, dominated, and overrun by the emergence of technology. There are positives and negatives to the state of today’s game versus the game our grandfathers and their grandfathers played. Technological advancements in equipment have undeniably made the game easier and more enjoyable for most players. The ball flies longer and straighter, woods are larger yet lighter, and irons use perimeter weighting to ensure the toe-ball you just hit still carries the junk. At golf courses, technology has allowed conditioning to reach new levels. Golfers have grown to expect immaculate fairways and greens, and bunkers raked to perfection. Rangefinders give us the exact yardage, not only to the hole, but to lips of traps and branches of trees. In the same breath, technology has taken away from the experience of golf. Smartphones have made avoiding a phone call, text, email or tweet virtually impossible. When the pace of play is slow, it’s easy to open the social media of your choice and start scrolling. One way or another, we often rob ourselves of the full experience of golf. Never before have I experienced pure golf as I did this fall at San Francisco Golf Club. It's a true golf club; there is no pool, no tennis courts, and a strict no cell phone policy. It keeps the distractions away and the focus on golf. Entering SFGC feels like entering a time machine. The inconspicuous entrance leads through the trees to a small parking lot. The men’s locker room features a wood-burning fireplace that is aflame before 7 a.m. and original, wooden lockers from 1915. It feels as if A.W. Tillinghast himself could round the corner to greet you at any moment. As you would guess, there are no carts available. Even further, caddies are mandatory. At SFGC, the game is meant to be played as it was in 1915. It means rangefinders are not allowed, and your caddie won’t have one either. If you think that’s tough, wait until you come to realize that there are no distance markers on the course – none at all. The caddies are familiar with the course and will eyeball the yardages for you and tell you how to play the shot (this gets more confusing if you haven’t dealt with the San Francisco marine layer, which makes the ball go considerably shorter). The caddies will tell you everything you are used to getting from your rangefinder. Are they as accurate? 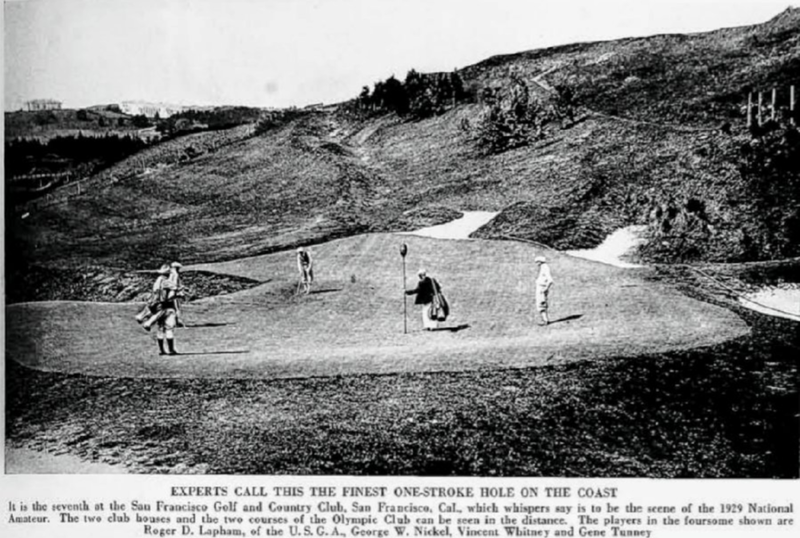 Of course not, but this is how the game was played when this iconic track was constructed, and the club has preserved the guesswork, feel, and player-caddie relationship that is now absent in other courses. Playing without exact yardages at a course you have never seen is significantly more difficult than I could have imagined. My playing partner, Ryan, and I estimated it was a full three shots more difficult, especially because SFGC happens to be very hilly. The elevation changes, coupled with the fact that it is a strategic masterpiece (meaning well-placed bunkers on the inside of doglegs, amongst other things), meant that we had to put serious thought into every shot. There were no easy decisions as every shot presented its unique risks and rewards based on your angle of entry. San Francisco GC isn’t insanely difficult (73.6/133 from 6,836 yards), yet I cannot remember playing a golf course that required more thought than this one. It rewards good strategy and execution and punishes the opposite. Is that not how golf is meant to be? I could write thousands of words about the excellence of San Francisco Golf Club's design. It was strategic, featured no weak holes, had immaculate conditioning and left nothing to be desired. The artistic bunkering looked like Tillinghast had Alister MacKenzie hanging over his shoulder during construction. Somehow none of these aspects were my most vivid takeaway from San Francisco Golf Club. I learned, or perhaps relearned, what made me fall in love with the game of golf. While on the course, nothing outside of it had to exist for the time being. It was just my group and the golf course. I only worried about how much club to take, only had to find answers to questions like how I could two-putt from over a massive ridge, and only feared that the round would eventually come to an end. While walking a golf course that looked like it belonged to the land rather than forced into it, my only distraction was the conversation with a good friend that I met through – you guessed it – golf.